I have always wanted pearly white teeth and tend to be self conscience to smile when taking pictures and tend to keep my hand over my mouth when speaking to people because of my horrible looking teeth, but thanks to Smile Brilliant I will have the freedom to smile and express myself without fear and embarrassment. I just LOVE this product and up until I started using it I had accepted the fact that my teeth will never be pure pearl white like all the pretty women in magazines showing off their perfect smiles. My dentist told me that my teeth have a grey/yellow undertone to them and pure white is off the table for me, however he offered to whiten them but the offer came with a huge price tag of $500.00+. After finding out that insurance wouldn’t cover the cost of having my teeth whitened and that I would have to pay out of pocket, plus the fact that he couldn’t guarantee how many shades lighter my teeth would be didn’t sit right with me so I declined his very expensive offer. Due to the fact I am a caffeine addicted the whitening wouldn’t last that long unless I perpetually went back to the office to purchase more whitening agent which would cost me a small fortune because from the time I wake up in the morning until about 4pm in the afternoon I drink rich delicious coffee than I switch to Diet Pepsi and that pretty much keeps me going until bedtime. On occasion I enjoy some red wine which really doesn’t help keep my teeth looking white. 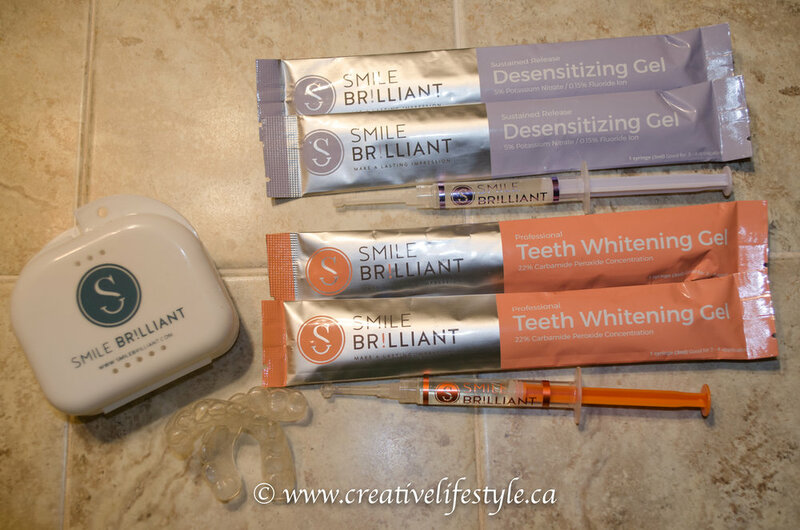 I was deliriously happy and jumped at the chance when Smile Brilliant asked me if they could send me a free whitening kit and all I had to do was talk about it ~ wow, can you imagine that? My dentist was going to charge me $500.00+ and I didn’t see any difference between what I received in the mail days later compared to the kit I would have paid through the nose at the dental office. After reviewing their website and found that their whitening kits start at $129 I was shocked that I could essential not have to leave the house, the kit would come to my door ~ how convenient is that? I have tried everything from purchasing costly whitening toothpaste, to coconut oil pulling, brushing my teeth with baking soda, rinsing with hydrogen peroxide and even brushing with apple cider vinegar; all supposed natural forms of teeth whitening which only left me feeling sick, gagging and discouraged. Smile Brilliant is so different and so much easier to use than all these home whitening remedies. The whitening agent has a pleasant minty flavour and believe it or not when I am done whitening my teeth they actually feel cleaner and my mouth feels fresher. The kit comes in a lovely blue and white box fully loaded with 2 impression trays, 3 sets of impression material (extra just in case I messed up), teeth whitening gel and desensitizing gel, postage paid envelop; I got all this as well as professional lab services included. Check out unboxing video below! I quickly and easily mix up the catalyst paste and base paste and created my own impressions. I mailed them off and in no time I received my custom fitted trays in their own case and I was all ready to start whitening. I love this product because I can whiten anytime and anywhere because it is simple and easy to use. The trays are clear so if I wanted to I can go shopping and no one will be wiser! I generally like to get into bed and whiten before I go to sleep. My bedroom is my sanctuary where I love to hang out watching TV, reading or doing blog work before I go to sleep; what a perfect time to whiten! By simply filling each tray with about a third of the syringe with whitening gel and popping them into my mouth for 45 minutes to 3 hours once a day and in no time my teeth have been whiter than they have been in years. I have not had to use the desensitizing gel as I have not experienced any pain or sensitivity while whitening, but if you have sensitive teeth, load up each tray with a 1/3 of a syringe of desensitizing gel and wear for about 15 to 20 minutes prior to whitening. I am so impressed with this product not only by the results but by price and ease of use and highly recommend it to anyone who doesn’t want to break the bank to whiten their teeth. The holidays are around the corner and I look forward to smiling through all the photos my friends and loved ones will be taking this season and thanks to Smile Brilliant I won’t be hiding behind everyone with a partially covered mouth.